Home>Music> Lil Pump Catches Heat For Mocking Asians, Rapping "Ching Chong"
Lil Pump has officially followed in the footsteps of one Rosie O'Donnell. In this day and age, people must pay the consequences for their racially insensitive commentary. Unfortunately, Lil Pump seemed to have missed the memo. The rapper recently previewed a new song called "Butterfly Doors," and while the song has elements of a banger, it also features a morally dubious punchline, delivered at the expense of Asians worldwide. Near the end of the preview, Pump compares his inebriated self to former NBA player Yao Ming, lining his punchline with an offensive "Ching Chong" ad-lib; it's not entirely dissimilar to Rosie O'Donnel's notorious "Ching Chong" laden rant. Not only did he make fun of the language, but he also pulled his eyes back for some visual mockery. Of course, "eyes-looking-Asian" punchlines have long been a staple in hip-hop music, and continue to pop up even now. Yet Pump's recent bars have not been going over well, as legions of Chinese fans have flooded his Instagram feed with presumably disparaging comments. Now, it's clear that empathy is too much to expect from Lil Pump, who continues to do whatever he wants with little to no serious consequence. Yet one has to wonder if the young man is destined to crash, especially if he continues his insensitive ways. Of course, he'll likely pay little mind to the backlash, and it would be surprising to see the song changed accordingly. 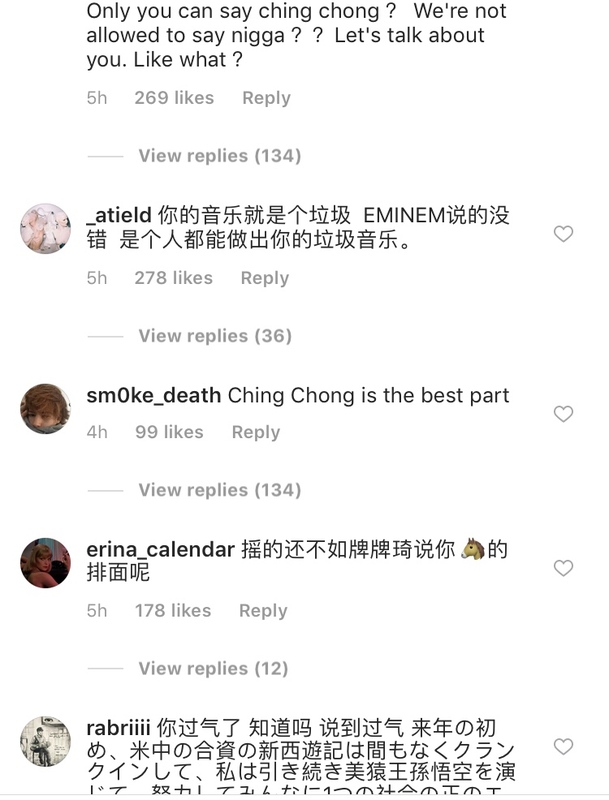 As of now, the comment section on Pump's latest post continues to come alive with Chinese messages, some of which appear to be calling Lil Pump "the N word" in retaliation. Where is J. Cole when you need him? MUSIC Lil Pump Catches Heat For Mocking Asians, Rapping "Ching Chong"